On the day Ameneh died, Iran's VPN ports were already shut down. Access to the worldwide web was cumbersome and limited but suddenly some reported that their mobile networks had stopped working too. Usually this is a sign that something has happened and the regime is trying to stop the spread of some news. 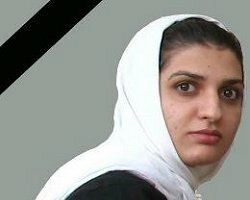 The news in this case was the tragic fate of AKU student, Ameneh Zanganeh, the only child of a war martyr, who had worked hard to get into the university as a post-graduate student, studying polymers. Her death was a series of blunders which describe the incompetence of Iran's current officials. Ameneh should have been allocated a place at the uni's dormitories as she was entitled to but instead she had to sleep in the uni's prayer room which lacked basic facilities like shower and bathroom. The university has a pager system to announce special alerts, like there is a male worker in the dormitory for example, which can be heard throughout the buildings. No warning however was given that the cleaners had just poured strong acid into the pipes to unclog them, when Ameneh decided to have her shower. The deadly acid gas fumes leaking from the pipes filled her lungs and she collapsed on the floor. Three hours later, her unconscious body was found by her friends. She was unconscious, but still alive. Ameneh was taken to the university clinic. Doctors in the clinic were unable to help her because they had run out of oxygen supplies in the clinic. Ameneh was then taken to the nearby Firoozgar hospital but this time doctors needed to apply electric shock to her and the hospital equipment was broken and not working. Ameneh died as she was being transfered to another hospital. Ameneh's tragic death and the apathy shown by the university's board of governors in accepting any responsibility led to widespread protests across the campus. The current AKU university principal, Alireza Rahaei, was Ahmadienjad's tutor when he was doing his PHD. He was made the principal when Ahmadinejad became the president despite strong objections by other AKU university academics. To say Rahaei is a much hated figure amongst the students is very much an understatement. There's something seriously wrong with the university's functioning. What makes me wonder is why the regime decided to shut down communications? Will the protests spread beyond the school?